on which I have worked on during 2018. N for nimble, logo design proposal for a 'beautiful apps developer': symbol, 2 secondary variations and full logo with a customized type. The idea behind the concept is to show movement / transformation / evolution represented by the ascending color progression. T letter mark / logo design proposal for a software developer dedicated to blockchain and cryptoassets. C letter mark with drops within showing a creative process. Logo design symbol exploration for a music / media related project showing a play icon with a sound equalizer within. Another direction for nimble, a 'beautiful apps developer'. Symbol + full logo proposal. The idea behind the concept is the same, to show movement / transformation / evolution represented by the color progression. Logo design proposal for Scentlab, a selective perfumery shop, an S letter mark combined with a lab tube / vial. A dynamic logo design created for Statement, a new party series / electronic music events organizer. These are some coloring explorations created for one of the shape variations. Logo design proposal for cue.mx / Cue Mix, an electronic music related project featuring a dynamic, colorful play icon. An explosive E letter mark created as logo design symbol for Elate, a music, events and entertainment company. Logo design proposal for New Black, an entertainment company. Logo design proposal for IcebergTech - a hub covering several internet and tech companies. Logo design proposal created for Moasaic, a project dedicated to modular care home management systems. Skyscrapers forming a V letter mark and a heart, logo design for a real estate project. Logo design proposal for a new chain of gas stations, Oilitus. GF monogram, logo design symbol for a traveling / guests review app. Logo design proposal for Uplyft Capital: U letter mark, shield, upwards arrows, skyscraper, pocket. Logo design symbol proposal for Romanian LEGO Users Group community: 3 bricks + flag + heart shape. Abstract NB monogram, logo design proposal for New Black, an entertainment company. Logo design proposal for Moving Dots, a company that takes a modern approach on finance industry. Exploring a logo design symbol, a whale tail combined with sea waves under a sun / sunset visual. Spinning S letter mark / spiral, logo design symbol exploration. Logo redesign proposal for Mob Show, the highest rated live trivia and general knowledge quiz show on Play Store. Logo design proposal for Zorko a financial consulting company based in Russia. Symbol shows a geometric Z letter mark combined with up and down arrows stylized as a diamond bar. The type is custom made. A geometric D letter mark, logo design symbol for a digital / tech / education conference. B letter mark + eye, logo design symbol proposal for an artificial intelligence project. Logo design exploration for finance project: S+N letters + % symbol. Another logo design proposal for cue.mx / Cue Mix, an electronic music related project featuring a dynamic, colorful play icon. A sub-branding update of a phoenix bird, logo design symbol for an energy / petroleum company. 'connecting the dots' - social media campaigns. Geometric heart construction / logo design symbol. An isometric direction, a D letter within a cube, logo design symbol for a 3D scanner technology. A simple line art honey bee logo design symbol exploration. Logo design proposal for appruv, a safety / security management tool for apps and websites. The symbol shows a box constructed from letter A in blue and a check mark interacting. A dynamic (4 variations) logo design proposal for New Black, an entertainment company. Logo design created for PowerPing, a server software monitoring system. Approved / implemented logo design project for Mend.Ai, an artificial intelligence system focused on medical research. Logo design proposal for Grokio, a custom logotype / word mark for a social network with dating communities. colorful dots standing for people gathering / interacting. M for mindfulness, a mountain with the vision and clarity you get when you reach the top of it. Organic dynamic modern rose logo design symbol / app icon for a flower and gifts shop. Another logo design direction created for New Black, an entertainment company. Logo design symbol proposal for a server software monitoring system. P letter mark pinging into progression. logo design symbol for a company focused on mobile advertising. A dynamic F letter mark / logo design symbol constructed from pills and capsules, created for a pharmaceutics project. Logo design for Topus, a project focused on architectural 3D scanning / printing: a T letter showed in the negative space. Logo design proposal for apps developer, an F letter mark + sliding buttons / toggle switch. Logo design proposal for Blocknauts, a blockchain consultancy firm. Logo design for a landscape / terrain 3D scanner / printer, architecture project. You can see here 2 variations, a basic one showing fields / plains and hills and another further exploration including sky and clouds as well. real-time monitoring of your products and competition for all online retailers'. Logo design proposal for Red Fish Game Studio, which, as the name says is a games development studio. N letter mark, logo design symbol explorations for an entertainment company. Logo design proposal for Elevate Security, an ES monogram + stairs for a digital security project. Logo design proposal / exploration for a real estate business: a star formed by houses / roofs + arrows. Logo design mark exploration: S letter, sea, waves. Logo design proposal for Audience Mob, an online marketing agency, a geometric AM monogram showing growth and evolution. Logo design proposal created for Constellation, a digital marketing / innovation agency specialized in social media campaigns. Variations for an S letter mark combined with a lab tube / vial, logo design proposal for Scentlab, a selective perfumery shop. Logo design proposal for Uplyft Capital: U letter mark, shield, skyscraper building, pocket. Logo design proposal for Movie Showdown, a multiplayer trivia game for movie lovers. A film strip twisted as the letter S.
Logo design construction based on letter A and check mark symbol. V letter mark, logo design for a real estate project based in Netherlands which also inspired the buildings style and coloring. a T letter showed in the negative space formed by buildings viewed from top. Logo design proposal for Turn It Up music management company, record label and music publisher with offices in Sydney, Los Angeles and London. Logo design symbol exploration, brain in a briefcase shape created for an artificial intelligence project. a software company that creates products to help people build more effective websites in an easier way. and arrows for an umbrella company involved in interactive entertainment consumer brands. Inspired by Gleb Kuznetsov work, given as reference by the client, I created 20 variations for 20 visual emotions / states of an ai interface. Google search and display advertising and conversion rate optimization. Logo design symbol proposal for "a series of social network / dating communities for different interest groups". Logo design proposal for a medicine artificial intelligence system. Custom type / typography created for hotel_es logotype / word mark / logo design proposal. Another logo redesign proposal for Mob Show, the highest rated live trivia and general knowledge quiz show on Play Store. a literal representation of a cliff / mountain / construction edge. Logo design proposal for Elements Culture, a colorful EM monogram for a design related project. Exploring a lovely happy dog face for a logo design symbol. 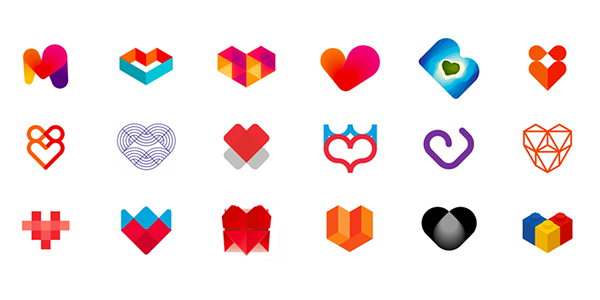 Hearts logo design symbols collection. Sharing some ❤️! 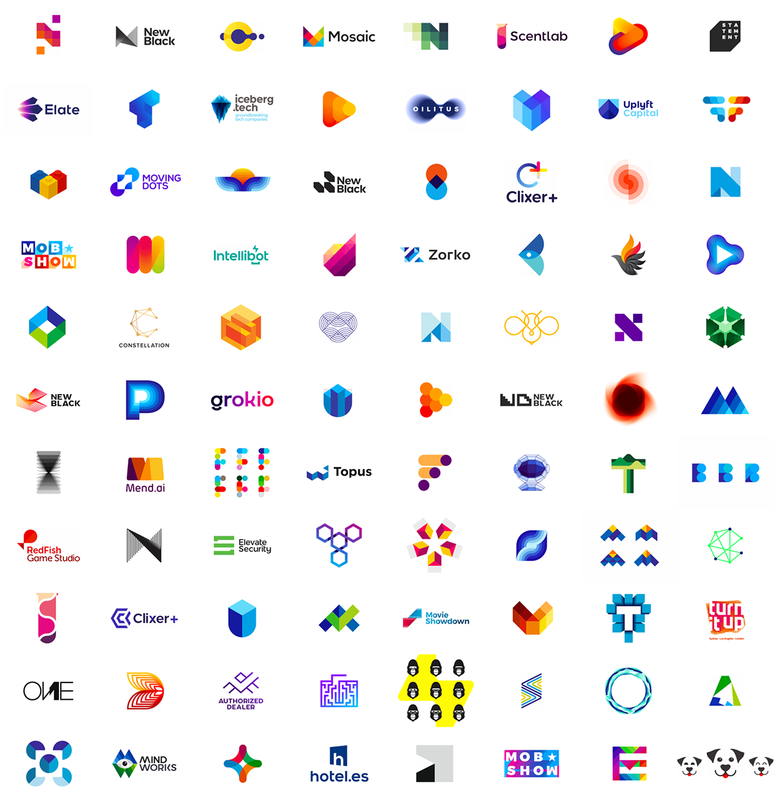 A selection of logo design projects created in 2018 - 2019: logo designs, icons, marks, symbols, monograms, letter marks created for worldwide clients.